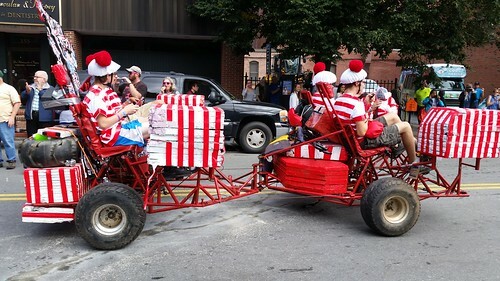 For the third year in a row, yesterday’s Lowell Kinetic Sculpture Race was a big success. A kinetic sculpture is an all-terrain, human-powered art sculpture engineered to race over roads, water, mud and sand. 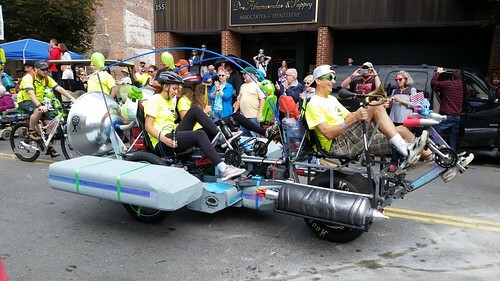 The race kicked off shortly after 10:30 am on Market Street with 11 kinetic sculpture vehicles accompanied by dozens of bicyclists carrying pit crews and supporters. The route took them over the cobblestones of Middle Street, a short distance on Bridge Street to French Street, then up to the Tsongas Center to traverse the mud pit. The racers continued on Father Morissette Boulevard and across the Howe Bridge and through Pawtucketville to Lowell Heritage State Park where they entered the water to prove their buoyancy. From there, it was back to downtown and the finish line. 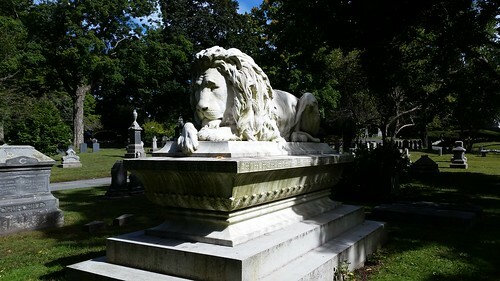 Both tours begin at the cemetery’s Knapp Avenue entrance (77 Knapp Ave) which is next to Shedd Park. The tours last 90 minutes and involve a moderate amount of walking. The tours change from year-to-year although the Friday and Saturday tours will cover the same course and subjects. They are free and take place rain or shine. The Saturday tour also coincides with the Cemetery’s annual art exhibit. 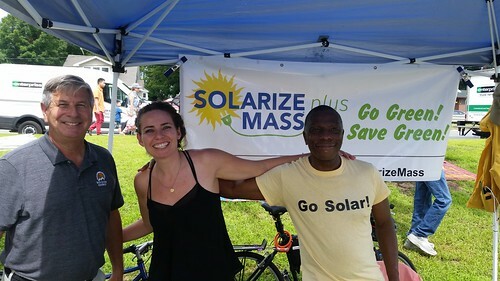 Solarize Plus Lowell is a program formed through a partnership between state agency MassCEC, the City of Lowell, and volunteers geared towards Lowell residents interested in solar and/or heat pumps. By using collective buying power and volunteer effort to drive down the price, ReVision Energy is the trusted installer for the best quality product possible. Lowell Residents can install solar and/or heat pumps in the most cost-effective and quality-driven way and help speed up Lowell’s transition to renewable energy. ReVision Energy’s installation team will make a presentation beginning at 6 pm. Next Saturday, September 29, 2018 from 9am until noon, there will be a community cleanup of the Western Canal starting at Ecumenical Plaza, which spans the canal between St. Patricks and Holy Trinity Greek Orthodox churches. 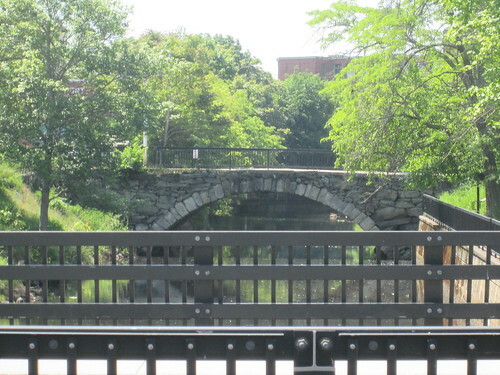 The event is sponsored by Canal Water Cleaners, Lowell Parks and Conservation Trust, Coalition for a Better Acre. Everyone is invited to attend and participate in the cleanup. 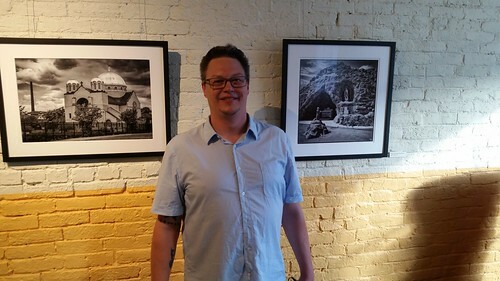 Last Tuesday was the opening of a new photo exhibit in the Reflections Room of the Boott Cotton Mills Museum. “Lowell’s Urbanscape: A Legacy of Newcomers” features 14 black and white photographs by Jen Bauer, chair of MCC’s Department of Communications, and Jeff Caplan of Black Ant Photography. The pictures feature places around the city that are central to the lives of the many immigrants who have come here throughout the city’s existence. The exhibit is sponsored by the Humanities Center at Middlesex Community College and is hosted by Lowell National Historical Park. The exhibit will remain up for the next twelve months, so you have plenty of time to see it. Led by U.S. 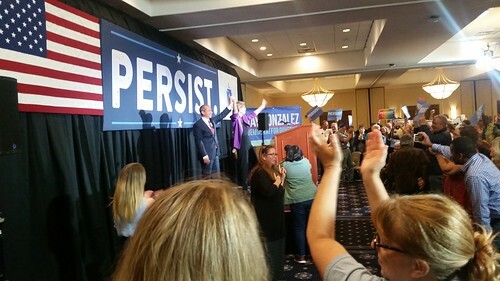 Senator Elizabeth Warren and featuring gubernatorial nominee Jay Gonzalez, Democrats from across the Merrimack Valley gathered at the UMass Lowell Inn & Conference Center on Friday night for a big campaign rally. 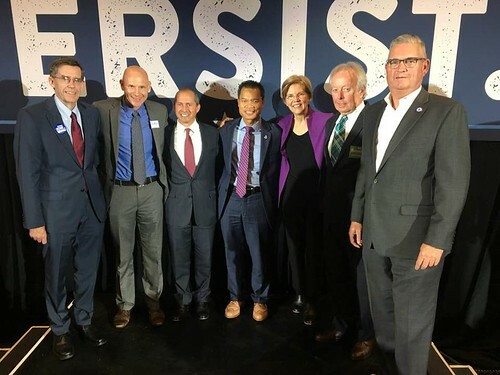 Both Warren and Gonzalez criticized Baker for his endorsement of Geoff Diehl, who is Warren’s Republican opponent this year and who was also the co-chair of the Trump campaign in Massachusetts. (Diehl and some supporters held a brief event outside the ICC before Warren arrived). Warren and Gonzalez both spoke in support of the National Grid workers who have been locked out by the company (many of whom were in attendance last night) and also supported the Yes on Question 1 (minimum staffing for nurses) advocates who were in attendance. Also speaking at the rally were Lieutenant Governor nominee Quentin Palfrey, State Senator Barbara L’Italien who spoke on behalf of Congressional nominee Lori Trahan, State Senate nominee Ed Kennedy and State Representative Rady Mom. As the Democratic nominee for Register of Deeds, I opened the program by welcoming everyone to Lowell and introducing the other elected officials who were present. For more information about the rally, read coverage in the Lowell Sun and Boston Globe. 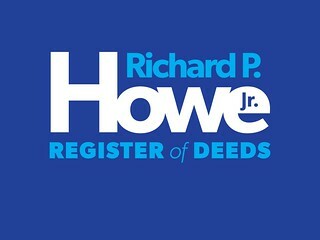 On Monday, October 1, 2018, from 5:30 to 7:30 pm at the UMass Lowell Inn & Conference Center, there will be a reception to support my re-election campaign for Register of Deeds. Donations are appreciated but not required. All are welcome to attend.